This set of goblet-shaped gold-foil earrings, embellished with precious inserts and beads, is typical of the goldsmith tradition of Dorgali. The jewel is a faithful reproduction of the traditional model. 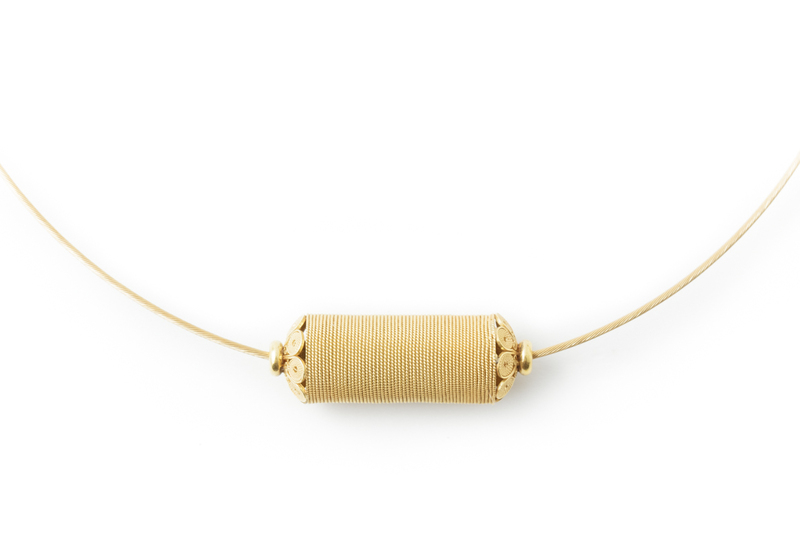 The precious filigree thread draws delicate relief on the surface of the exquisite gold handmade pendant. Enhanced by finely crafted elements reproducing the parts of the traditional button, the jewel is a fine synthesis of the evolution of Sardinian goldsmith’s art. Gold foil bangle, embossed and chiseled, commonly referred to as the “slave bangle”. Entirely handmade, it features a special bezel with an agate engraved with Augustus ' effigy. It consists of three finely decorated sections joined together by a sophisticated knuckle joint system. 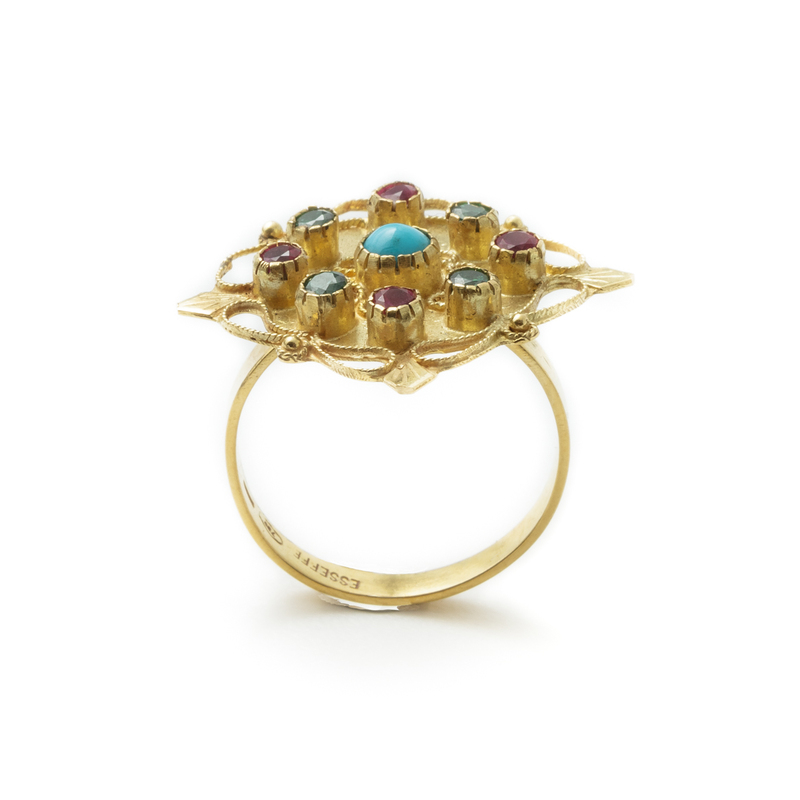 This traditional ring featuring gold and mounted stones, is called anellu de punta. It is part of the goldsmith's tradition of Orgosolo, the renown town at the heart of Sardinia. 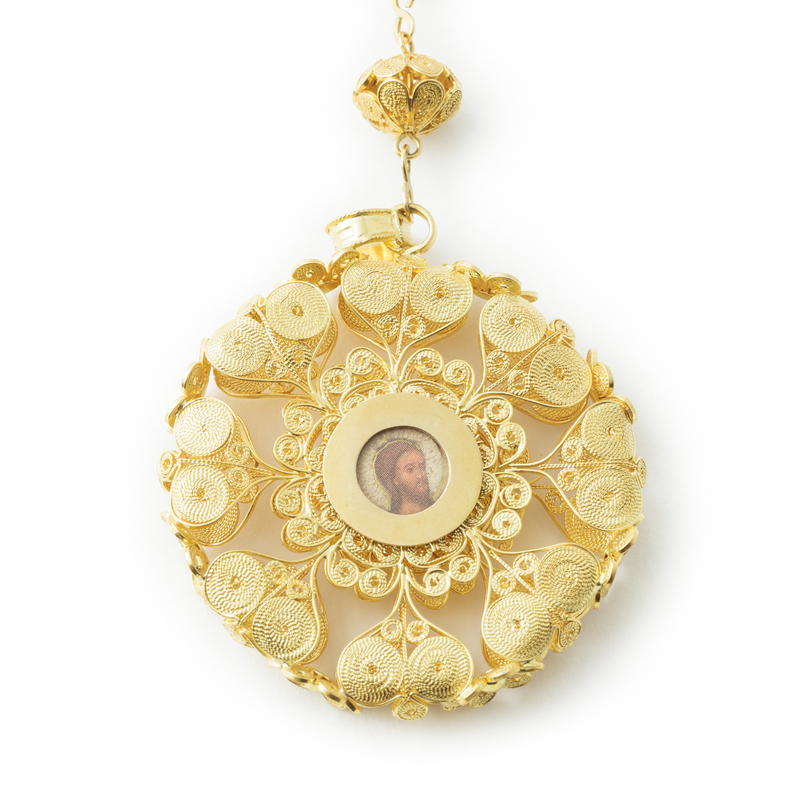 This precious hand-crafted gold filigree prayer’s paten features a central sacred icon. Being a subject of great prestige and tradition, it expresses the best of the filigree crafting technique and highlights the expertise of the craftsman. Francesco Serra is a filigree goldsmith, member of the well-known School of Dorgali. After graduating as a MA at the Istituto Statale d’Arte di Nuoro, he started his apprenticeship with great passion. In 1983, he opened Esseffe in Dorgali, where he offers faithful copies of traditional jewels and modern and original filigree pieces. His creations are sold together with a certificate of guarantee, that certifies their quality and origin. These unique jewels are hand-made using reinterpreted traditional techniques. His collections are displayed at fairs and collective sector exhibits at local and national level. 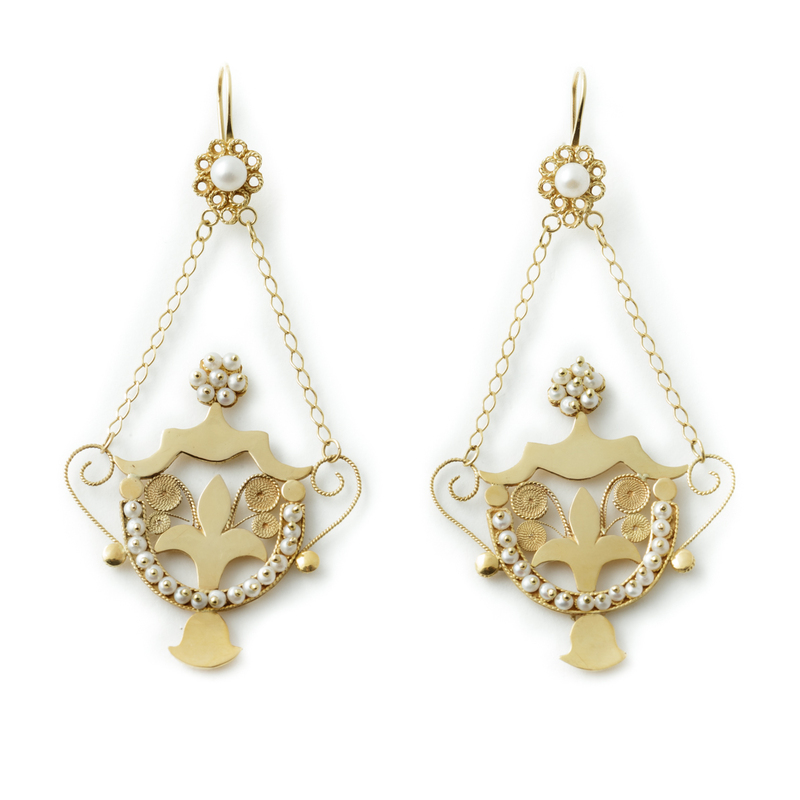 The collection includes traditional filigree jewels and modern pieces. A rich and varied production, that includes necklaces, pendants, earrings, rings, bracelets and much more, all sold with a a certificate of guarantee, that certifies their quality and origin. All objects are made with ancient classic goldsmith and filigree techniques. Mountings, embossed works, fretworks and engravings are performed with great skill and expertise.